Welcome to 29B Nubble Road. This new home was just completed on 2014. Be one of the first to stay in this luxurious home. The first floor features 3 bedrooms, all with queen beds and a full bath. The second floor is where you will find the open concept kitchen, living room, dining area. This floor also has the half bath with laundry and outdoor deck with ocean views. The third floor has 2 more bedrooms, one has a king and a single sleep sofa and the other has two twins plus a trundle, as well as a full bath. This is a very comfortable clean house that is modern, and only a short walk to the beach. . You do have a view of the ocean , but there is a house directly in front of you, so it is a partial view of the water. The house is well equipped, but you must supply all your paper goods , We were 6 Adults and it was more then enough space for us . Highly suggest this house if you have a large family , for there is more then enough room . Nice, clean home with plenty of space and a great view. Loved that it was walking distance to beach and to town. House was perfect for family trip. Great layout, comfortable, good location and walk to both beaches. A truly great place, spectacular location, magnificent views. Had a wonderful time. Accommodations super. 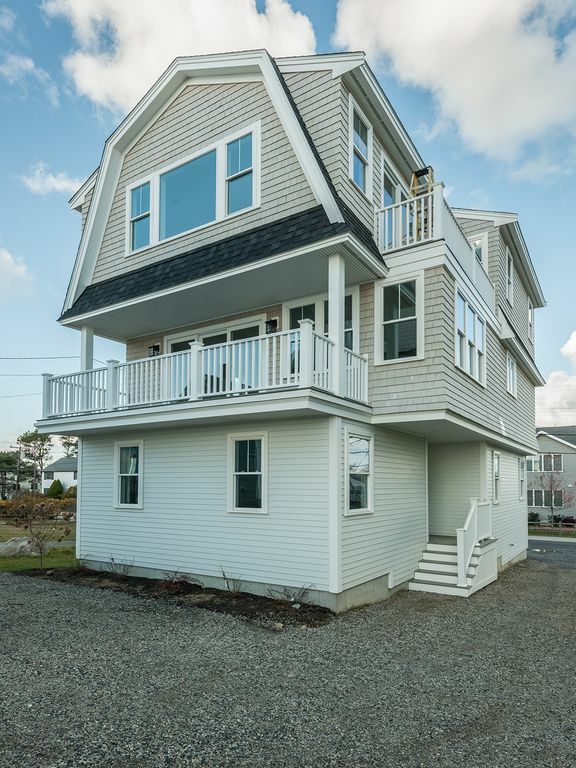 Spacious new home in a great location in York beach. We love it there. We were 9 adults and 3 kids and we had a great stay. Thanks to Heidi for being reachable and so welcoming. My only caviat is that the kitchen is missing some basic equipment. Not enough cooking pots when cooking for 12 people. No whisk, no wooden spoons, no electrical egg beater, nothing to mash potatoes, had to use a bottle of wine to roll my pies, not enough coffee mugs... A small investment here would improve the overall experience to a 5 stars for me who loves to cook. I rent a lot with VRBO and usually a house of this quality would be equipped with more kitchen essentials. That being said, it is a great house we enjoyed our stay very much. Thank you !